Gameloft has released its historical first person shooter, Brothers In Arms 2: Global Front, as freemium software in the Android Market. The freemium version, dubbed Free+, is free to download, is ad-supported, and features the ability to purchase medals in the game with your real-life cash in order unlock new features and gear faster than earning it through gameplay. Brothers In Arms 2 was originally released in 2010, but was exclusive to the Gameloft store, where the ad-free version still sells for $4.99. 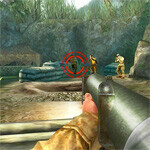 This is Brothers In Arms 2’s debut in the official Android Market. The game features a single player, story mode and multiplayer. The single player has 50 different missions that are set in various locations around the world, while the multiplayer has 5 maps that can be played by up to six people over Bluetooth or Wi-Fi. Finally, Brothers In Arms 2 also features an array of weaponry and vehicles to use during combat. You can check out some of the gameplay in the video below and grab the Free+ version of Brothers In Arms 2: Global Front in the Android Market. Study for a Spanish test or play Brothers In Arms 2.....Who am i kidding adiós español and hello brothers in arms 2!!!! HEY! HEY!! Hit thoughs books young man!!!! Works fine on the RAZR, the Verizon RAZR. Dont worry, it is free via ad support like a lot of other apps. Yea as if that's the worst thing that can happen on a smartphone. . .
go to options and try out different controls there - you should get the hang of it after a few tries. You give up too easily, young padawan.